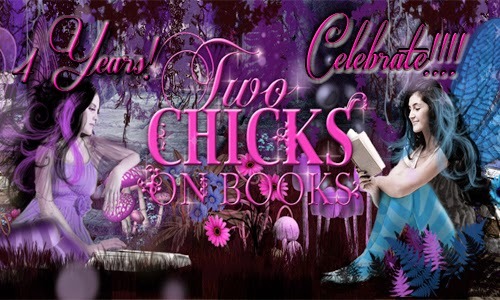 Two Chicks On Books: Two Chicks on Books Turns 4! And a Giveaway!!! I also remember the awesome authors and publishers who have been a blessing to work with I love you all! If I mentioned everyone this would be quite a long post. But I did want to send a special shout out to Veronica Rossi, Talia Vance, Katherine Longshore, Cory Jackson, AG Howard, Sara B Larson, Claudia Gray, Martina Boone, Maria V. Snyder, Cat Winters, and Joelle Charbonneau you have been some of my favorite authors and have become amazing friends! To the local ladies we must meet for Margaritas soon! So what has changed in 4 years? It doesn't seem like much but it's actually been a lot. To start I had a partner... but after the first year it wasn't working out so we parted ways. I couldn't lose the blog name I had come to love so I'm still Two Chicks on Books. I've also gone through 3 blog designs and this current one is by far my favorite! When I first started blogging I had always dreamed of working in publishing and 3 years ago that dream started to come true. I became an intern at Entangled Publishing and 3 years later I'm a Publicity and Marketing Director for Month9Books! I love my company so much! Thanks Georgia McBride for the amazing opportunity! I also started a blog tour company with one of my besties Rachel from Fiktshun and Rockstar Book Tours has been a blast! I can't believe we've been doing this for 2 years now! So ok I'm not one for long winded posts but what I really wanted to say is thank you!!! All of you who have been a part of this 4 year journey I am so blessed to have each of you in my life and I'm looking forward to more years of blogging to come and to meeting more awesome people! And to celebrate turning 4 I'm giving away stuff because whats's better than giveaways?!?! Because it's not legal per the FTC I can't require a follow but I really want my winners to be followers of my blog so I'd really appreciate it if you did! Awww, Happy Blogoversary Jaime and for listing me on your list of blogging besties! I am a horrible friend and blog tour partner! Thank you for keeping me sane and forcing me to blog when I might have otherwise quit. This time next year it will be 5 and I know you will still be blogging then. You are a tremendous asset to this community and the very best and most inspirational book lover and blogger I know. Crap didn't mean to hit "enter." I just wanted to add: ...even if you love Blogger more than Wordpress! Congratulations! Four years is such dedication. If you've reached four years, then I've been following you for at least three... it's been a pleasure and I hope that you will be in the blogging community for many more years! Your hard work and dedication is much appreciated and never forgotten. Congratulations! Congratulations - Jaime! So happy for you and that your blog exists. Congrats Jaime! I love your Blog and am so thankful for sweet bloggers like yourself who help newbies like me. Yay for you guys! Congrats and thanks for the great giveaway! I'm so excited for you! Happy everything!! I love your blog ladies and can't wait to see what you have in store for next year! Thnak for letting me be a part of some awesome rockstar book tours as well!! Happy New Year! Happy Blogoversary!!! :] 4yrs is amazing! Good Job :] looking forward to future post! Congrats on your Blogversary! That's totally awesome! AND thank you for the giveaway! Congratulations on the Blogaversary. Thank you for all the reviews/recommendations. And thanks for the giveaway! Congratulations! Four years is awesome. I love getting advice on the best books out there and which should be on my TBR first. Happy 4th blogversary! Love your site, thank you so much. Happy 4th blogversary. May 2015 be even better. Congratulations! Thanks so much for the reviews and interviews about new books and authors. I love reading your blog. This giveaway is AWESOME! Congrats!!!! Here's to as many more as you want!!! So happy for you!! Congrats! Congrats and Happy Blogoversary!!! Thanks for doing this awesome giveaway! Congratulations! Happy Blogoversary! =) Thanks for doing this awesome giveaway! Congratulations and Happy Blogoversary! Love you and love your blog, and I'm so thankful to have met you this year! You're a gift to the book community! Congrats on your blogaversary!! That's so fun. I love your blog! I hope it has many many MANY more bday's to come! Happy blogaversary! I love your cover photo! Congrats! 4 years is an awesome accomplishment! Thank you, so much for being so generous with the giveaway. Happy reading and blogging! Happy 4th birthday, y'all! 2 years in the blogging world is a feat, but 4 is a pretty huge deal! Congratulations, and I am looking forward to seeing what comes next for Two Chicks! Thank y'all so much for this amazing giveaway! Truly awesome!